Enjoy this beautiful vacation rental home on Lake Superior surrounded by beautiful mature trees and nature. Towering Pines is a vacation rental home located near Lutsen, MN. This home boasts 3 bedrooms, 2 bathrooms, and a gentle sloping yard leading to the shores of Lake Superior. Stroll down to your private section of ledge rock beach. Sit back, relax, and enjoy the sounds of the waves lapping against the shoreline. The cozy living space features a living room, dining area, and kitchen, plus a wood burning stove. This large living area is great for gathering together with friends and family. Enjoy great Lake Superior views from the dining table. The kitchen is well-equipped with what you will need to make a homecooked meal during your stay. The dishwasher is great in saving time doing dishes while on vacation. The first bedroom on the main level has a full bed. The dresser provides plenty of room to unpack and really enjoy your vacation. The second bedroom on the main level also has a full bed. Plus plenty of natural light flowing through the two windows. In the upper level sleeping loft area you will find a large sleeping space- great for kids. The sleeping loft area features a full bed and two twin beds. A second TV provides entertainment for those not quite ready to hit the hay at the end of the night. The first bathroom features a shower/tub combo and is located on the main floor. The second bathroom, also on the main floor, has a hand held shower head/tub combo no actual shower. The laundry room is accessible for guests and great for extended stays The sun porch is truly a highlight of this property- with sweeping Lake Superior views. Grab a seat with a cup of coffee and a good book and listen to the waves of Lake Superior and the birds chirping in the mature trees. Towering Pines can be your North Shore home away from home. 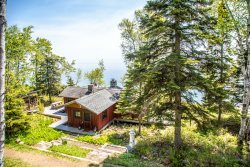 Just step out of thhe sun porch, down the stairs, and onto your own little slice of paradise on Lake Superior`s North SHore. With large trees hugging the home and a long driveway from the highway you`ll feel very secluded in this peaceful home. The slope leads down to the private section of Lake Superior shoreline. Grab a seat or light a bonfire and enjoy your ledge rock beach. Amazing views are your to enjoy in every direction. Explore the rugged shoreline of Towering Pines. Or just grab a seat and enjoy the views. This is your view coming onto the property from the dirt driveway. The main entrance of Towering Pines as you will enter upon arrival. When you see this, you`ll know you`re home. Imagine sitting on the screened in porch of a quaint Lake Superior home and looked out over the gentle sloping yard that leads directly to a picturesque ledge rock beach along the Great Lake's North Shore. You can have all of this, and more, at Towering Pines. Towering Pines is a comfortable, 2-story vacation rental home with three bedrooms and two bathrooms home in the heart of Lutsen, MN, The large screened deck is perfect for warm weather gatherings complete with comfortable porch furniture. The living/dining/kitchen are an open floor plan for easy socializing. The property leads directly to your own private section of ledge rock shoreline where you can sit back after a long day and listen to the waves lapping at the rocks. The home offers privacy and serenity while being centrally located to many North Shores offerings. At Towering Pines you are conveniently located just up Highway 61 from downtown Lutsen and only 5 minutes to Superior National at Lutsen Golf Course and the Lutsen Mountains Ski and Recreation Area, which offers many activities in the summer months including an alpine slide and sight-seeing gondola to the summit of Moose Mountain. Take a short drive up the shore to Cascade River State park where you will find an enchanting waterfall after a short, easy hike. You are close to many dining options including the Lakeside Dining Room and Poplar River Pub at Lutsen Resort, Moguls Grille & Tap Room at Caribou Highlands, and Papa Charlie's Restaurant & Tavern at Eagle Ridge Resort. All of which features live music from popular local musicians throughout the year. Grand Marais is just a 15-minute drive up the shore where you can spend a day shopping and dining in the town's many unique shops and restaurants while enjoying a hike out to Artist's Point or just a stroll around the Harbor. Whether your goal for your trip to the northwoods includes adventures like hiking and biking along the Superior Hiking Trail, golfing at Superior National at Lutsen, or just resting a relaxing at home, Towering Pines can be your North Shore home away from home. Towering Pines is a seasonal cabin open May-October. We liked the house. It was very clean, well stocked kitchen, lots of towels and good location. Liked the beach area and ability to have a fire. Recommend a shower current in bathroom. Towering Pines worked out great for a mini-family vacation. Everything you would want in a North Shore cabin, felt like home. The property is conveniently located near Lutsen and Grand Marais. We had a family of four and it was very comfortable. We spent our days hiking on the Superior Trail so the home was very cozy and welcome at the end of the day. All amenities are included even some spices and teas to share. Cool weather so we would build fires on the rock cliff overlooking the lake and listen to the lapping waves. So soothing! We have been coming to Towering pines for I believe 7 or 8 years now. the location is excellent for the hikes we do. The amenities are great, this is the first year we had to take our garbage to a new location, but was easy to find. I liked the lock box as we did not get in until late Thursday night, this was very convenient. The house was great! Extremely clean and well-stocked. Really great location- serene and secluded yet near everything. We thoroughly enjoyed our stay at Towering Pines. The house is lovely and we especially enjoyed the screened in porch and location on the water. Beds are comfortable. It is nicely equipped with everything one can need for a stay. A minor complaint would be that the chairs on the porch are very uncomfortable, they need new cushions. The one bathroom only has a hand held shower. It would be better to have a shower curtain to be able to stand up and shower. We have rented many private homes, first through Superior Properties, now with you. We looked at this home back in the 90's but it didn't fit our needs at that time. We absolutely love this residence. There was nothing wanted in the kitchen it was so well stocked. When we book this home again all we need is our clothes and food. We love to read and the lamps were perfect. We love the location close to the Clearview store. We used to rent the Norwood Shores townhouse when they were in the rental program...wish they still were! The cabin was very comfortable. The layout was open and inviting, the amenities were excellent. Nice touches from the cleaning staff. The location was convenient to groceries, coffee shop, Lutsen Mtn and Grand Marais. I highly recommend Towering Pines. My least favorite was the shoreline. It was more cliff-like as opposed to a pebble/rocky shore. However I knew this from the posted pix. The house was very nice! It was clean, the beds were comfortable and the towels were fluffy! The kitchen had plenty of utensils along with plates, cups and bowls - even napkins and paper towels!! The furniture out on the screened in porch could use a little more padding - they were not very comfortable to sit on and we rented the property because the screened in porch sounded so great. We didn't use it as much as we wanted. The beds upstairs could be moved - it would be nice to have the larger bed by the window instead of the twins. (That could be more personal preference). The location was perfect for what we wanted. Being able to sit and enjoy the lake was wonderful! We enjoyed it very much and will recommend (& may even stay again) Towering Pines! When checking out, it would be nice to get some kind of confirmation. As soon as I entered the code, there was nothing on the line. we really did like the home, we like the screened in porch over looking the lake the best. Spent a lot of time out there, played cards and games, relaxed and just visited. Very enjoyable. Would have liked more seating down by the fire ring. Can not really sit on the rocks, at least I can't. One suggestion for the kitchen. Since there was not a garbage disposal, and I do understand why, I would place one of those small strainers that are made for sinks to catch the smaller food particles that stick to plates and such. we enjoyed the home, my daughter like this one the best of all the places we stayed and we hope to return next year. We come back every year. The home is great, location great, and wonder view. We've used Towering Pines multiple times and have always been satisfied as our vacation home.we wouldn't change a thing. We stayed a week at Towering Pines home on the lake. It could not have been a more delightful vacation! House was great with a wonderful view and amenities.It had all we needed including two coffee pot, regular and decaf!! Perfect location to Grand Marais and no road noise. Overall, a pecfect getaway!! Would recommed it to anyone! This property is comfortable, and so well equipped you'd think you were at home. It has a gorgeous shelf rock beach with many spots for quiet contemplation. The cabin is spacious, yet cozy and the nicest we've stayed in.